For over 10 years, Licht microprocessed platforms have successfully integrated electric power systems in Brazil and around the world (in Australia, Chile, Portugal, Uruguay, Vietnam, Peru, and other countries). In our clients’ high and extra high-voltage installations, Licht instrumentation is permanently monitored by supervisory systems, without any history of failures. This demonstrates the full compatibility of our devices with mission-critical electric power systems, which should be extremely reliable. 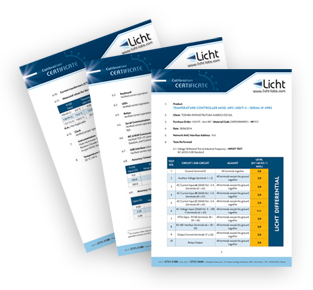 In this technical presentation, we cover the electrical isolation of Licht instruments, one of the pillars of our high-reliability engineering. The Block Diagram, in the video below, portrays the typical construction of a Licht Microprocessed Platform, where two aspects of the dielectric characteristics are highlighted: FULL GALVANIC ISOLATION BETWEEN CIRCUITS and THE EXTREMELY LOW VALUES OF CAPACITANCES BETWEEN THEM. Download the PDF of the Block Diagram here. Circuits with full galvanic isolation as represented in these blocks behave as if physically separated, without any electrical contact. The full galvanic isolation between power supply input and outputs, and between power supply outputs ensures full pairwise circuit isolation. Data and energy transmission between blocks happens exclusively through optic and magnetic means. This isolation is not only valid for DC potentials, but extends to AC transients. By design, stray capacitive coupling between blocks is minimized, and limited to small residual values. This minimizes transient capacitive coupling between circuits in any direction, and provides immunity against wideband switching transients which are typical in power installations. The ROUTINE TEST CERTIFICATES, performed on every manufactured device, are consistent with these high isolation levels (2.0 and 3.0 kV, 50/60 Hz, 1 min. ), in every possible mode (with up to 9 modes). The IPT CALIBRATION CERTIFICATE shows the typical capacitance between the previously mentioned blocks, demonstrating its extremely low levels. Learn more about our MFC-300/R Voltage Regulator: a relay for power transformers with onload tap changers (OLTC). If you want to learn more information about our multi-functional platform or would like a quote, please get in contact with us at +55 11 3731-3188 or send us a message by e-mail (info@licht-labs.com) or through the form below.